These earrings are even more beautiful in person than the pictures show. They are truly a work of art. 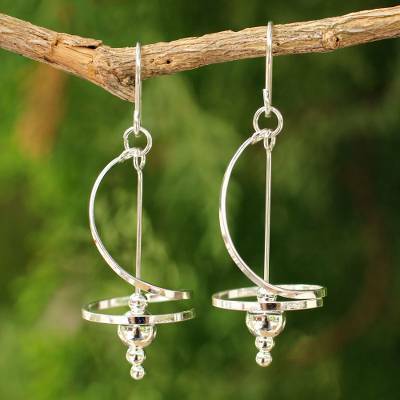 "Pirouette Sterling Silver Dangle Earrings"
My earrings are stunning. They seem to dance around as you walk. They sway gently in the breeze and are so comfortable, you'll probably forget you're wearing them until someone says your earrings are so pretty, where did you get them? They are absolutely my favorites. Also, you're not going to see them everywhere, they are hand crafted. This earrings are lightweight, dangle beautifully from one's ears, and are unique in design. I gave them to a friend who loved them! To Aoy: I love these earrings! Bought them as a gift, but will have a hard time giving them up! Such a lovely design, I hope you will make more. These earrings are beautifully made, terrific quality and craftsmanship (craftsWOMANship?). As another purchaser said, they do actually "dance" as you wear them. A very clever design. I hope to make additional purchases from this artist! Nice and large and perfectly fitting of the description. A wonderful present for my mother's birthday. These are really some of the nicest earrings I've purchased! Love the movement in them and they feel really nice on! Thank you for your excellent work! I will buy more of your earrings and other jewelry! These earrings go with anything you wear from dressy to blue jeans. Love them. These earrings are so beautiful! They swirl and sparkle when I wear them. Artistic beyond words. Light weight and easy to wear. Love these earrings. They are delicate yet so different and grab attention with their design. They are lightweight and forget I have them in. Some of my favorite earrings I own. These are unique & fun to wear! I love the movement and these are one of my favorite pair of earrings. My only complaint is they would have looked better if they had not both been "lefties". Hair got caught in these! These earrings are very unique, sleek, intricate and beautiful. I purchased a pair for my mother and had a very difficult time giving them up. I eventually purchased a pair for myself and wore them to a wedding. I received countless complements on them, but I ended up losing one when I was kissing people goodbye :( I'm ordering my 3rd pair (2nd for myself) bc I love them so much. WEAR RUBBER STOPPERS WITH THESE EARRINGS! I love these earrings! They are unique, beautiful, and feminine. If you love contemporary sterling silver jewelry, this pair of earrings is IT! These are lovely earrings, the way they move is fabulous. Great length, finish and shine. Really beautiful and different. I like the unusual, I'm not a run of the mill person so, these earrings are perfect for me and very well made. I would highly recommend to anyone who is thinking of purchasing these especially, if you like to stand out a bit and not be like everone else. These earrings are lovely! I receive many complements every time I wear them. "They are just what I expected!" They are pretty and came quickly. The gift box was also very pretty...made my gift giving effortless! Beautiful and unusual earrings, expertly made. "Love the swing and shine!" A beautiful modern design and very well made. Love that they have some "swing" to them. I so love these earrings. They are beautiful and very unique. I bought them to give as a gift, and wanted something that was very different. This is it. I think my friend will be very happy! I love the movement on these earrings. They are unusual and simply fun to wear. A unique addition to any wardrobe. These earrings are unusually attractive. They reach out and not just invite attention but grab attention in a gentle way. Really fun to wear. These are a great gift, but I wanted to keep them for myself! So well made, sturdy and so different! Love them! I love this design and the workmanship of the earrings. It does look better than the photo. It is the first piece of jewelry I ordered from this company and I like all the earrings I ordered from here and it comes quickly and in small box that was put in my mailbox. Absolutely beautiful. True artistry. Lightweight and lovely to wear. Stunning, lightweight, graceful. Go with everything. "These earrings couldn't be more beautiful"
The design is so unique . I've never seen anything like them and am getting so many compliments. Thanks for your fine craftsmanship. "A gift my daughter will cherish"
These earrings are absolutely beautiful. They are a gift for my daughter. She will love them.